Real Rooms: Good Morning Sunshine! Design Board: Good Morning Sunshine! A touch of whimsy and a punch of color best describes this nursery design board entitled “Whimsical Sunrise Nursery” by Kid Stuff World. We just love creative inspiration boards. This one is particularly dynamic as it is ideal for bringing in color to white (even those unpaintable rental white) walls. Visit Kid Stuff World to find out where all this good stuff comes from. Oh, and the entire room is under $1000. 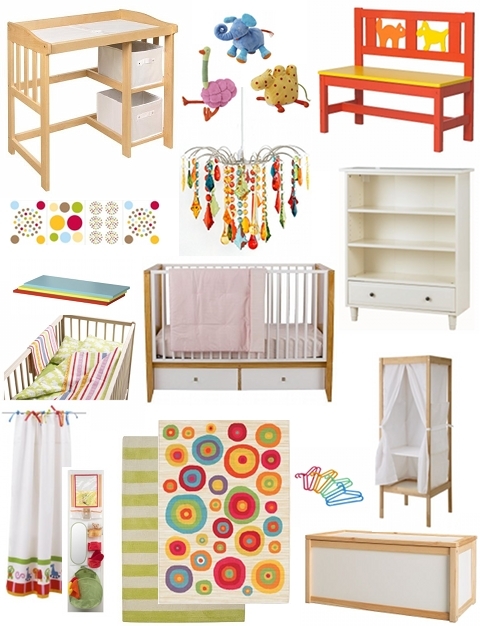 Now here’s to a nursery worth waking up to! I love this – gorgeous bright colors! Love that this is gender neutral and modern! Really cute! I love the multi-color crystal chandelier and the polka dot rug! Wow, under $1000 for all of that? Awesome. I’m impressed, the rug is adorable. Wow, totally my taste, hahaha so cheerful! Thank you for posting this great room! In seeing this post, I found the PERFECT chandelier for my 3 month old daughter’s room! We received it in the mail yesterday and it is just beautiful. My daughter is big into staring at the light bulb in her room, as I was searching for the perfect accessory for it. You did it for me! Look forward to installing it, I will send a picture of it dangling in all its glory!! THANK YOU THANK YOU THANK YOU! I love your site! Thanks Amy! That is soooo great to hear and motivating as we continue to upgrade and polish off our new site. And thank you Kid Stuff World! Hooray, my first success story! It’s been such a blast being featured here at Project Nursery, I’ve made some wonderful new friends and gotten a lot of new site traffic. Amy, if you’re reading this – we’d be stoked to share your story with our readers too.